This model is a handheld static electricity meter used to measure the magnitude and polarity of static charge on objects or surfaces. It is typically held 1” (25 mm) from the test surface. On metallic or conductive surface, the meter measures the voltage on the surface. 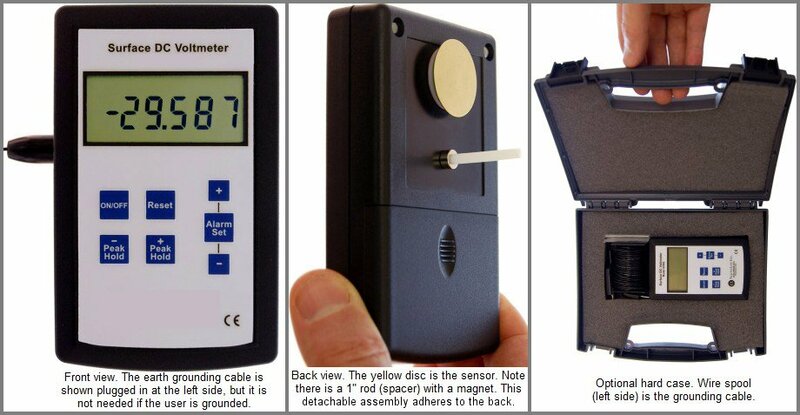 (As with any electrostatic voltmeter, the displayed reading depends somewhat on the size of the object being measured and the distance between the object and the sensor.) On insulating surfaces, “voltage” is not a well-defined number. In this case, the meter reads a number proportional to the static charge present. The model has high sensitivity (resolution), and can detect even a 1 volt charge anywhere within its full range of +29,999 to -29,999 volts. Thus it is easy to measure whether a given process is increasing or decreasing the static electricity present, even if the increase or decrease is by a tiny fraction. The meter reads the actual static signal, but it also captures and stores the highest positive and highest negative signals that were experienced since the last time that the “Reset” button was pressed. These peak + and – can be displayed at any later time. The peak function has a “window” time of 0.005 seconds (which is much faster than the display) so even very quick peaks are captured and stored. There is also a user-settable alarm. The alarm will sound if the signal (whether + or -) ever exceeds the value set by the user for at least 0.005 seconds. The alarm can be reset or muted at any time. DC Electric field strength in air (also AC, which is 1/3 of the difference between + and - peak hold numbers).